Aaron Goldberg has matured into one of the finest pianist and composers on the contemporary scene. His list of sideman credits is quite impressive, from Joshua Redman to Tom Harrell to Guillermo Klein to Kurt Rosenwinkel plus, since 1999, he's released 4 CDs as a leader and 6 as a co-leader. "The Now" (Sunnyside Records) is his latest and 5th featuring the rhythm section of Reuben Rogers (bass) and Eric Harland (drums). 3 of the 10 tracks were recorded in January of 2009 with the remainder in April of 2014. 4 of the tracks are Goldberg originals, 3 are from Brazilian composers, 1 Haitian traditional and 1 each from Warne Marsh ("Background Music") and Charlie Parker ("Perhaps"). What stands out throughout the program is the rapport of the Trio, who never fail to support each other and spur each other forward. Goldberg is one of those pianists who is very melodic, has a smart sense of rhythm and dynamics and, like Fred Hersch and Jean-Michel Pilc, never relies on pure technique to get his message across. There are times, such as on the original ballads "The Wind In the Night" and "One Life" (featuring guitarist Rosenwinkel), that transcend the moment, hitting on emotions close to one's heart. The guitar work is ethereal, sounding at times like a bird on a distant branch, otherworldly as the phrases rise atop Harland's splendid drum work. That's not to say this music doesn't have a touch of spice at times. "Yoyo", based on a Haitian folk melody, bounces delightfully atop Rogers' plucky percussive bass and Harland's dancing drum work. Parker's "Perhaps" (first recorded in 1948 for Savoy) is a playful jaunt that sounds more like Ornette Coleman than "Yardbird" but swings with great abandon. As does Marsh's "Background Music", which flies along at the speed of Chick Corea (with great snare work from Harland). "The Now" is yet another shining star in the discography of Aaron Goldberg. Even though it is a studio recording, the music feels quite alive; you can feel the sweat and hear the emotions. Great music from start to finish! For more information, go to www.aarongoldberg.com. 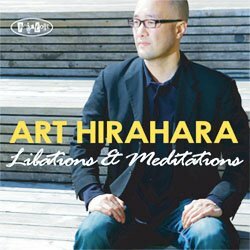 Pianist and composer Art Hirahara has worked and continues to work with a varied group of artists, from the late baritone saxophonist/activist Fred Ho to vocalist Bianca Wu to Travis Sullivan's Björkestra, bringing a fine sense of melody and rhythmic sophistication to each project. "Libations and Meditations" is his 2nd release as a leader for Posi-Tone Records and features his current working trio of bassist Linda Oh and drummer John Davis. In the 4 years since his previous release, the pianist has been extremely busy as a sideman yet his own music feels as if it has been matured like a good wine. One should enjoy listening to the interactions of the trio, especially how Davis locks into the groove and drives the uptempo tracks (most effectively on tracks such as "D.A.Y. ", "Be Bim Bop" and its partner "Bop Bim Be.") Besides leading her own group, Ms. Oh has become quite an in-demand "side person", working with Dave Douglas, Pascal LeBoueuf, and Kenny Barron. Her playing here frames most of the pieces on the disc, from the insistent pulse that lies underneath "Father's Song" to the "get-up-and-go" walking lines on "D.A.Y." to the impressionistic bowed bass beneath the rippling piano lines and cymbal washes of "Dead Man Posed." Upon repeated listenings, one can hear just how distinctive a pianist and composer Art Hirahara has become. Many of his pieces have strong melodies, rich chords patterns (there are moments when "Big Country" sounds like a Lennon-McCartney compositions) and his playing favors a 2-handed approach. There are 2 handsome solo piano tracks; "The Looking Glass", which has the elegance of a George Gershwin song, and "Karatachi No Hana", a work from Japanese composer Kosaku Yamada (1886-1965) that is lovely, with a flowing melody line and sounds quite Western. He can also swing quite delightfully - just listen to how the Trio navigates the variable rhythms of "Be Bim Bop" and you hear musicians who certainly have great "chops" but who are also having great fun. "Libations and Meditations" is music that deserves to be heard, not only on "record" but in person. The program has everything a piano trio - actually any sized ensemble - should have, in the intelligent melodies, great interactions and strong solos. This is music that is full of life and deserves to be part of yours. For more information, go to arthirahara.com.